Self-publishing is where you, the author, bypass all the intermediaries that are involved in traditional publishing. These intermediaries do the editing, designing, illustrating, marketing, promotion, etc. of your book. As a self-publisher, you get to choose which functions you want to do, and which ones you need to hire someone to help you. What You Will Learn In This Post1. You will learn how I define what self-publishing is all about for me. 2. You will learn why I find it important to define self-publishing as a business. 3. You will learn about the 3 main stages that the process of self-publishing can be broken down into. Self-publishing is where you, the author, bypass all the intermediaries that are involved in traditional publishing. These intermediaries do the editing, designing, illustrating, marketing, promotion, etc. of your book. As a self-publisher, these functions will typically be your job. Although, you can easily hire people to do these functions for you and still be considered a self-publisher. As a self-publisher, you get to choose which functions you want to do, and which ones you need to hire someone to help you. 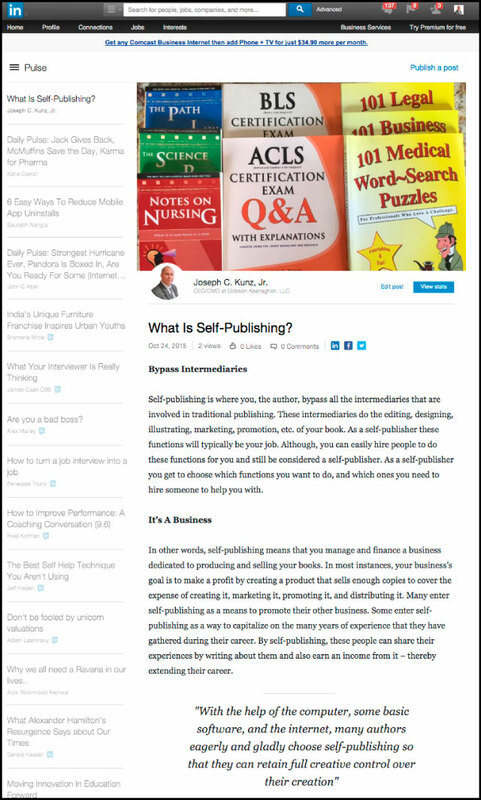 SPAN APSS What Is Self-Publishing? In other words, self-publishing means that you manage and finance a business dedicated to producing and selling your book. In most instances, your business’s goal is to make a profit by creating a product that sells enough copies to cover the expense of creating it, marketing it, promoting it, and distributing it. Many enter self-publishing as a means to promote their other business. Some enter self-publishing as a way to capitalize on the many years of experience that they have gathered during their career. By self-publishing, these people can share their experiences by writing about them, and also earn an income from it – thereby extending and enhancing their career. • Stage 3: Selling: which involves marketing, promoting, and selling yourself and the book. Linkedin – What Is Self-Publishing? In the past, many authors chose to self-publish because they could not get a traditional publisher to publish their book. But today, with the help of the computer, some basic software, and the internet, many authors eagerly and gladly choose self-publishing so that they can retain full creative control over their creation – their book. By retaining control and ownership over their book, they can profit from it for many years. With a big traditional publisher, a book will typically have a very limited life-span. Self-publishing is a very powerful, exciting, and alluring concept. On its simplest level, it’s a way to get your words and ideas to a world-wide audience. On an artistic level, it’s an extension of the creative process. Self-publishing is a fun, interesting, and profitable way to satisfy your need to create a product, share it with the world in an appealing way, and make money doing it. 1. As a self-publisher, which functions do you like to do? Which ones do you prefer to hire out? 2. Are you entering self-publishing to share your knowledge with as many people as possible? Or as an artistic outlet? Or simply to make a profit? Or all three? This entry was posted in Business Model, Podcast, Self-Publishing and tagged Design, Development, Editing, Intermediaries, Marketing, Podcast, Production, Profits, Promotion, Self-Publishing, Selling, Traditional publishing. Bookmark the permalink.